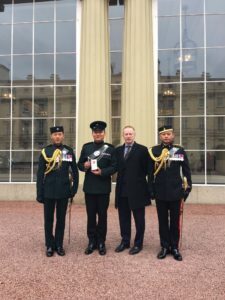 On Tuesday 14th November 2017, Her Majesty The Queen presented Major Prembahadur Gurung RGR and Captain (Retd) Gaubahadur Gurung with MBE’s at an Investiture at Buckingham Palace. 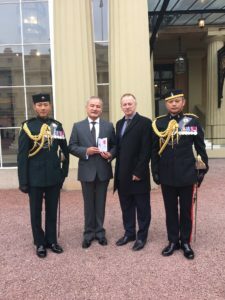 Major Prem was awarded an MBE for his outstanding tenure as Gurkha Major 2 Royal Gurkha Rifles. During a singularly demanding period that included attending to the aftermath of two devastating earthquakes in Nepal, community outreach, compulsory soldier redundancies, public duties and preparing for operations, his exceptional commitment to the well-being of the Gurkhas and their families and his massive contribution to community relations were noted and recognised. Captain Gaubahadur Gurung served a long and distinguished career in 2 Gurkha Rifles and as Assistant Director of Music before becoming a civil servant working for the Ministry of Defence. For his support of Service Personnel in Essex he was awarded an MBE. 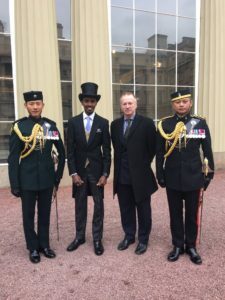 Colonel Brigade of Gurkhas was delighted to be able to attend this wonderful day and catch up both with Major Prem and also his old friend Captain Gaubahadur. Receiving his Knighthood on the same day was Sir Mo Farah, so the team took the opportunity for a photograph with a global sports star.